ARAMIS Followspot 4.5/8 with mechanical dimmer. 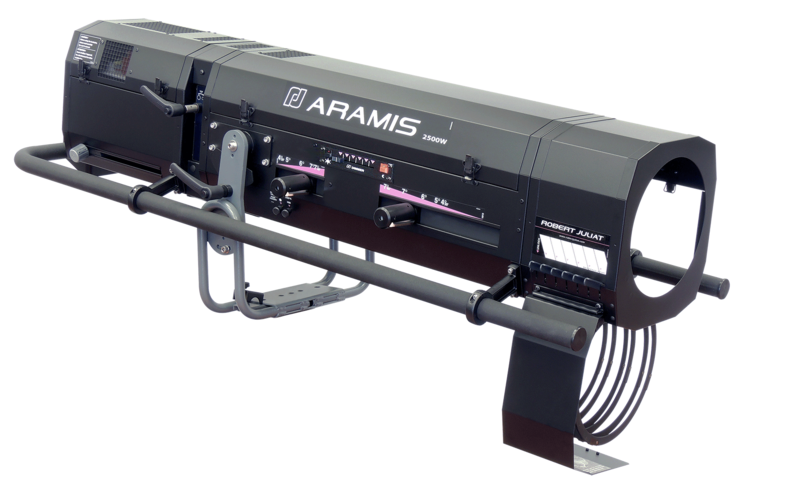 The Aramis uses a 2500w HMI lamp with quartz condenser. It is ideal up to 90metre throw distance. Complete with an automatic self cancelling 6 way colour changer unit (Boomerang) and mechanical dimmer. The Aramis uses a 2500w HMI lamp with quartz condenser. It is ideal up to 90metre throw distance. Automatic self cancelling 6 way colour changer unit (Boomerang). Mechanical dimmer, protected iris cassette, “B” size gobo holder, frosted glass on flip lever (for a soft light effect), Colour correction filter and a new heavy duty adjustable yoke. Standard ballast is magnetic however there is an option of ordering electronic ballast with P.F.C. High performance quartz condenser optical system. 100% closing iris with black plate follower in a removable cassette.